Silver Scindapsus is from the flowering plant of Araceae. It is also known as Silver Vine and is known for growing deep green leaves with a satiny finish and splashes of silver. This easy-to-care plant filters out a variety of air pollutants and begins to remove more toxins as time and exposure continues. 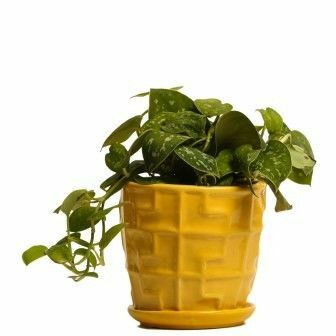 It is a wonderful houseplant placed in a finely crafted yellow colored pot, which is technically designed and keeps both the planter and the plant safe.